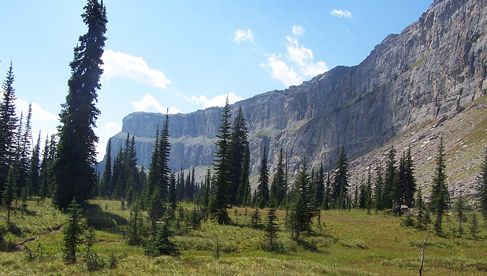 Deep in the heart of Montana is some of the wildest, most beautiful country that has never been settled – the Bob Marshall Wilderness. This land is rugged and stunning, full of adventure and undiscovered treasures. 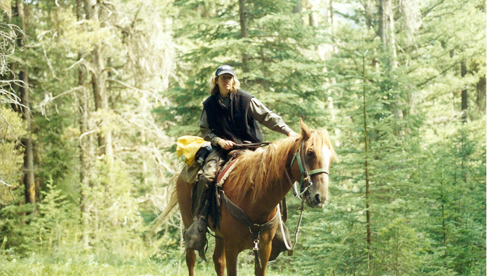 The Haas Family, owners of A Lazy H Outfitters, have been taking guests on guided horse pack trips into this spectacular country since the late 1920’s. 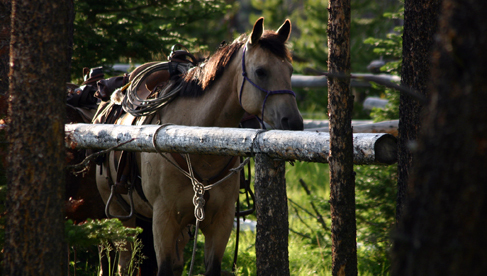 On a horse packing trip into the Bob Marshall with A Lazy H Outfitters, you will find any number of outdoor activities suited to your inclinations. And you will not find a more appealing environment to enjoy and explore this spectacular country. A horse pack trip is a unique way to see this remote, beautiful country. On any given trip you have the opportunity to see large game animal species that call this country home, ride to vistas commanding expansive views, or fish the remote streams full of rainbow trout. 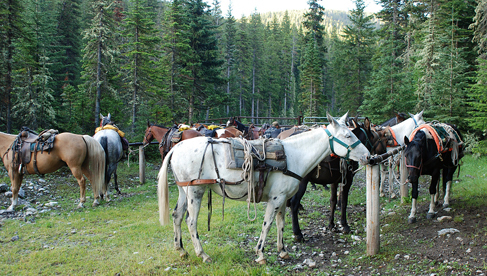 Horse packing trips range from 5 to 8 days, and offer different emphasized activities for each trip. The total group sizes for each trip are rather small. A Lazy H Outfitters welcomes singles and couples, and do their best to put you on trips with similar interests. They also offer additional discount consideration to groups who fill a private trip. Spring time in the mountains is a colorful event. The mountain peaks will be covered with snow and the country will be a lush green. 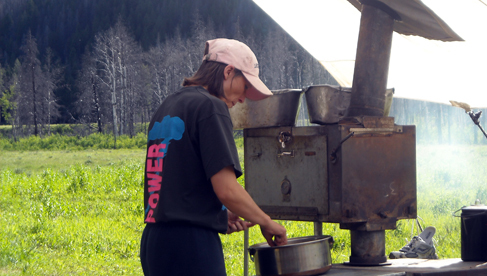 We will stay at several campsites along the Sun River. 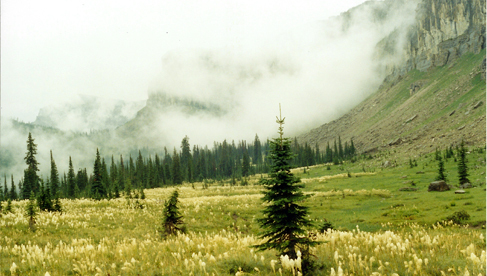 Among the highlights of this trip are Route Creek Pass, Biggs Creek Pass, and the vast open meadows of the upper Sun River. This trip is the best of all the trips for seeing big game wildlife. We can see elk, goats, moose, and bear this time of year before the summer’s heat and more visitors disperse them to higher ground. The countryside at this time is resplendent in natural color with most of the wildflowers in full bloom. 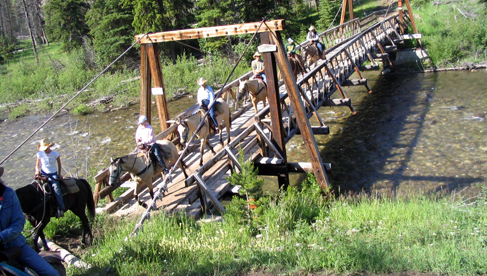 This trip visits one or two campsites on the upper Sun River and focuses on the abundant riding and scenic opportunities. Depending on your interests, we can take several day hikes, day rides or even try the early fishing possibilities. This trip often doesn’t move from one camp, but it’s possible to do two camps if the group is so inclined. The options range from visiting a fire lookout tower perched atop a mountain peak (day ride) to riding through the lush valleys and hidden meadows along the river bottoms. This trip is designed for the fishing enthusiast. 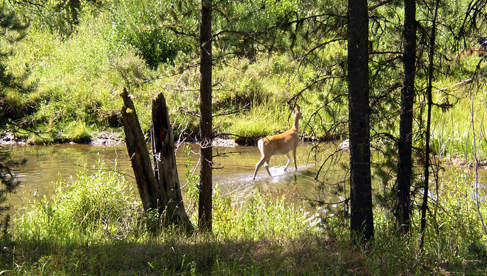 We will either stay at our beautiful Gates Park campsite on the North Fork of the Sun River. 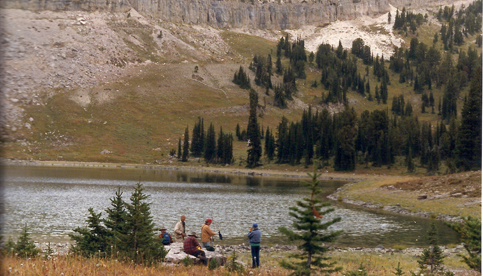 There are excellent fishing opportunities from either camp. The North Fork is about 1⁄4 mile from camp, and on this part of the river you won’t see too many other fishermen. There are also many non fishing activities possible from this campsite. These include possible day rides to the Chinese Wall & Sock Lake, Bear Top Lookout, or easy and relaxing rides along the Sun River. This trip follows the Sun River from the upper North Fork to the South Fork. You visit three different campsites. This country is quite open and offers great day riding as well as superb fishing. There is excellent fishing at each campsite and we stay at each campsite for a day to allow as much opportunity to explore and fish as possible. The rides from each campsite are generally pretty easy and the views along the broad valley of the Sun are fantastic. For the non-fisherman, there are excellent opportunities for riding to some interesting spots, as well as probably the best day hiking of all of our summer trips. This trip is the reverse of the previous trip – from the South Fork of the Sun River to the upper North Fork to the Sun. You visit three different campsites. This country is quite open and offers great day riding as well as superb fishing. There is excellent fishing at each campsite and we stay at each campsite for a day to allow as much opportunity to explore and fish as possible. The rides from each campsite are generally pretty easy and the views along the broad valley of the Sun are fantastic. For the non-fisherman, there are excellent opportunities for riding to some interesting spots, as well as probably the best day hiking of all of our summer trips. This trip explores the Chinese Wall by riding along it and opportunities to spend a day up close to the Wall exploring. This is a great scenery trip with some limited fishing opportunities. We visit several different campsites. 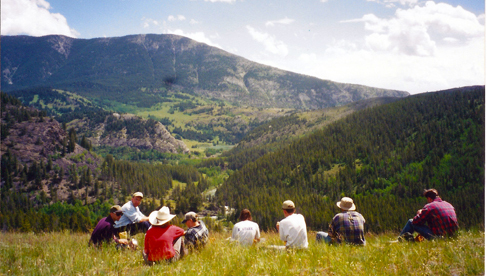 The majority of the time is spent in the high country. Just about every day offers outstanding views. The day we ride along the Wall is easily the most scenic of any single day on our summer trip schedule. 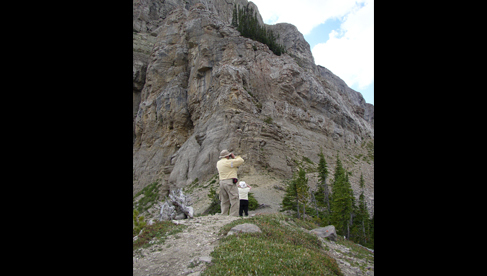 While the Chinese Wall is the highlight of the trip, the lower Sun River valley and the upper reaches of the Continental Divide near the Wall are spectacular as well. 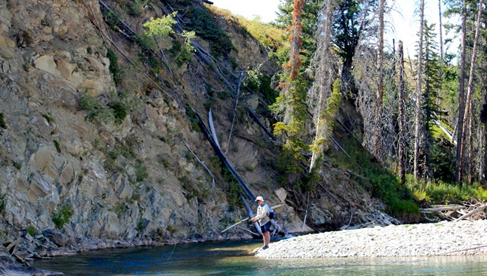 This trip is the last fishing trip on the legendary Sun River for the season. The North Fork is about 1⁄4 mile from camp, and on this part of the river a person won’t see too many other people while on the river. The dry fly fishing this time of year is just exception with a lot of terrestrial activity. 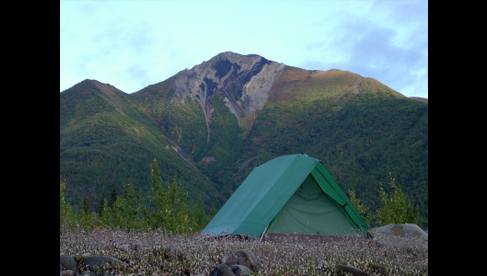 There are also many non-fishing activities possible from this campsite. These include day rides to the Chinese Wall and Sock Lake, Bear Top Lookout, or easy and relaxing rides along the Sun River. This is a traveling trip which starts on the east side and crosses over the Continental Divide and spends most of the trip on the upper reaches of the Middle Fork of the Flathead River and its tributaries. You visit multiple campsites. This country is quite open and offers great day riding as well as occasional fishing opportunities. While this trip is not targeted towards fly fishing, if there group has that interested we can slightly modify our campsites to provide additional opportunity.. Each campsite affords much opportunity to explore. The rides from each campsite are longer than the Sun River trips as the Middle Fork is a more rugged valley. This is our tentative schedule. If you see a trip you are interested in and are wondering about the different opportunities on the trip, give us a call at 800-893-1155. These descriptions are very limited and we can elaborate on the fishing, riding, and hiking more if you give us a call. 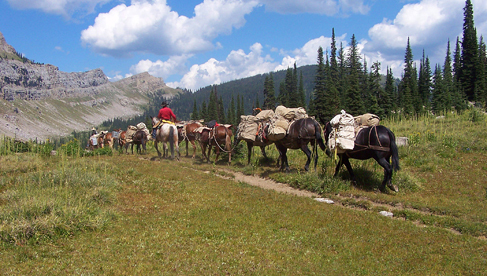 Horse pack trips generally move campsites every other day. The camps consist of comfortable sleeping tents large enough for a couple. Additionally, there is a large cook tent which serves as the kitchen. Hearty western fare is served, as the mountains tend to work up a powerful appetite. Breakfast is a variety of bacon, eggs, hotcakes, and the like. 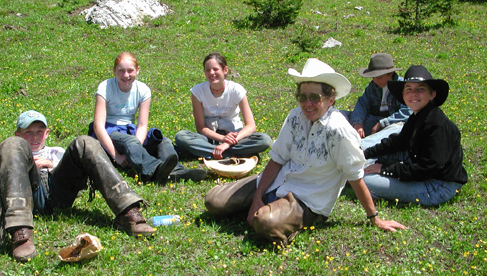 Lunch is often taken along the trail and is usually sandwiches, fruit, and similar sack lunch fare. Dinners are a nice variety of beef, chicken, seafood, various complimentary vegetables, pastas, salads, breads and always a decadent dessert. Activities range by the duration and focus of the trip with A Lazy H Outfitters. 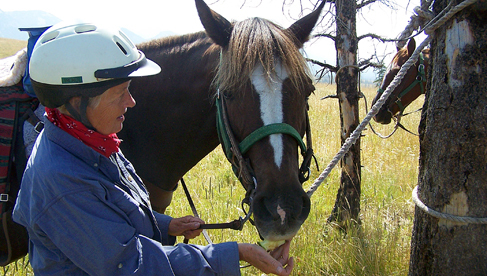 Horseback riding is a core activity as it’s the way we get around the mountains of Montana. On many trips you will travel every other day, and on non-traveling days you’ll have the opportunity to hike to ridges, meadows, lakes, or other nearby attractions. 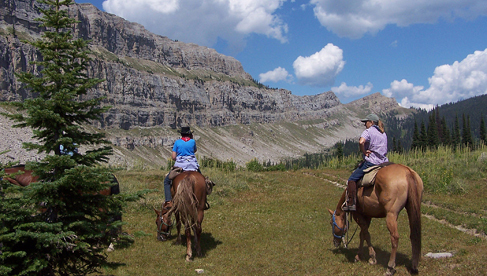 You may also decide to take a day horseback ride to a particularly special vista point, lookout, or scenic side route. Alternatively, many often try their hand plying the trout laden rivers in the Bob Marshall. 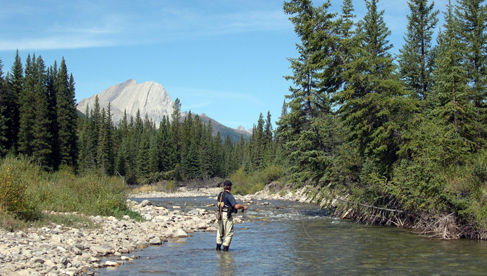 The fly fishing is particularly good in the summer months. 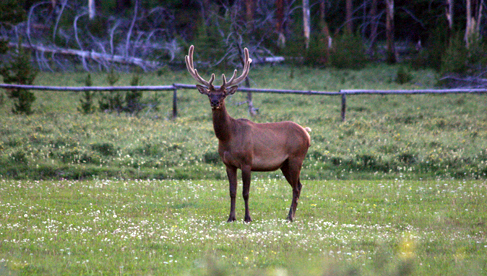 On any given day there is an opportunity to see all manner of wildlife ranging from elk, deer, goats, sheep, wolf, as well as a large variety of migratory and native birds. Choteau, the home base for A Lazy H Outfitters, is located on the main route between Yellowstone and Glacier National Parks. Many guests couple a visit to at least one of these extraordinary destinations with their horse pack trip. There are also some wonderful ghost towns nearby which make for a great day’s adventure. Also, you will find some excellent natural attractions near Great Falls, such as Giant Springs and the Great Falls of the Missouri. Culturally, you can get special insight into the West by visiting the Charlie Russell museum in Great Falls, or the Museum of the Plains Indians in Browning. Both are nearby Choteau. 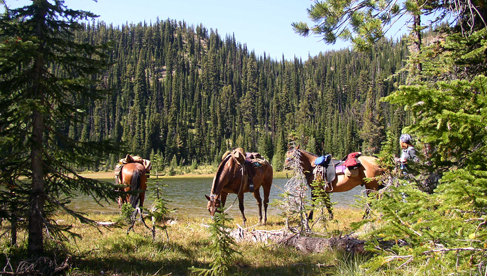 Wilderness horse pack trips in Montana’s spectacular Bob Marshall Wilderness between Glacier and Yellowstone National Parks.